Today’s blog post is from Dr. Michelle Collins, a Hubble Fellow working at Yale. After 9 years, 3 billion miles, a Jupiter fly by, and some of the most complex route calculations ever implemented, New Horizons reached its destination a couple of weeks ago on July 14th. This NASA probe went whizzing by our distant, dwarf planet neighbour Pluto at a dizzying speed of 31,000 mph, and has already provided us with a wealth of spectacular images, data and science. It will continue to spew out incredible discoveries about Pluto over the coming 16 months or so, as the flyby data trickles back to us. To say that this space probe has revolutionized our view of this failed planet is a giant understatement. Pluto has long been an elusive, poorly understood system, hovering on the periphery of our solar system. It was discovered back in 1930 by Clyde Tombaugh, an American working at the Lowell Observatory in Flagstaff Arizona. Due to some miscalculations of the mass of Neptune, it was initially believed that Pluto was a massive planet, at least as big as the Earth, and possibly up to 4 times the size of our home planet. So naturally, it was classified as a planet. However, as the decades wore on, the mass of Pluto was revised downwards, finally lurching to a halt at a mass of only ~0.2% the mass of the Earth in 1978, much lighter than originally thought. With this extreme weight loss, and the discovery of similar size – and even more massive – dwarf planets in the solar system (particularly Eris, discovered in 2005), Pluto’s status as a planet was starting to raise some eyebrows. And so, in 2006, when the International Astronomical Union met to decide what the lower bound on a planet should be defined as, Pluto didn’t make the cut, and was relegated to a dwarf planet. But, aside from it’s low mass, and controversial status as the only de-throned planet in the Solar System, what else did we know about Pluto, pre-New Horizons? Well, not very much, really. Given it’s huge distance (it’s orbit takes it anywhere between 2.7-4.8 billions miles from the Earth during a single Pluto year), it was hard for us to study Pluto in detail, or take a decent image of it, even with the Hubble Space Telescope. We knew it was an icy world, probably with a rocky core, and maybe underground oceans. It is mostly composed of Nitrogen, with some methane and carbon monoxide. It has an extended, tenuous atmosphere and 5 moons – Charon, Nix, Hydra, Kerberos and Styx. It is locked in a binary orbit with the largest of these, Charon. But the other, smaller moons appeared to us a little more than points of light in Hubble images. If we wanted to learn more about their composition, and that of Pluto itself, we’d need to get A LOT closer to Pluto. And so, New Horizons was constructed and launched on a mammoth journey on 19th January 2006 to our favorite minor planet to get a better look. It was the fastest spacecraft ever launched from Earth, and even managed to image Jupiter and its moons as a bonus science project on its way out to Pluto. Much of New Horizons journey was spent in hibernation (roughly 7 years), and it was finally awoken on December 6th 2014. From then on, it began imaging Pluto with its onboard cameras, LORRI (a high resolution reflection imager) and Ralph (a multi-filter, lower resolution camera and spectrograph). The combination of these two instruments provided us with incredibly detailed, color images of the surfaces of Pluto and Charon, that got clearer and clearer the closer they got to Pluto. In the weeks before the flyby, we could see that Pluto is a red world, with complex geology. A huge, heart shaped ice plain could be seen on its surface (informally named Tombaugh Reggio after the man who discovered Pluto), and evenly spaced dark spots located on the opposite side of Pluto, which are the size of Missouri, surprised astronomers. Huge craters could also be seen, and regions that seemed surprisingly crater-free too. We also learned that Pluto is a little bigger than we thought, with a radius of 1473 miles, making it larger (though still less massive) than Eris. The sheer variety of surface features, not only on Pluto, but on Charon also, increased the anticipation of the New Horizons team as their target drew nearer, as it was clear that the high resolution flyby would provide them with a treasure trove of answers to the questions already forming. Tensions were probably pretty high on the day of the flyby itself. After traveling 3 billion miles over 9 years, New Horizons needed to hit a window in space that was only 60×90 miles in size within 100 seconds of its predicted arrival time, otherwise it would miss Pluto. But the orbital calculations were bang on, and New Horizons was able to complete its full range of observations of Pluto and Charon, as well as taking detailed images of Pluto’s 4 other moons. Over the course of a few hours, New Horizons made high resolution maps of segments of both Pluto and Charon, with a maximum resolution of 60 meters per pixel. With that level of detail, you’d be able to count the ponds in central park! In addition to these maps, New Horizons also used several instruments – Alice, REX, PEPSSI and SWAP – to study the atmosphere of Pluto. So, what else do we know about Pluto now? TONS! For example, the high resolution mapping of Pluto has shown us ice flows on the surface, and evidence for recent geological activity, such as cryovolcanism, which is completely unexpected for such a low mass object that isn’t orbiting a more massive planet. It also has huge mountains ranges, that tower up to 11,000 ft above the surrounding plains. These are most likely composed of water ice. We also know more about Pluto’s atmosphere. For one thing, the solar wind appears to be stripping it away from Pluto, resulting in a cometary tail-like feature. It also has a hazy quality, where gaseous methane molecules are irradiated by UV light, causing them to condense into complex hydrocarbon molecules known as tholins, which are responsible for the reddish color of Pluto. Its atmosphere also seems to have a lower pressure than previously measured, and could imply that half of it is freezing out and condensing back onto the surface as Pluto segues into its colder season. We also have high resolution maps of Charon, Pluto’s binary companion. It too, has a geologically young surface, which is totally unexpected for such a small moon. It has a complex set of cliffs, troughs and canyons whose sizes eclipse the Grand Canyon here on Earth. These are thought to be signs of fractured crust on the moon, caused by internal processes. It also has an extended, diffuse dark spot at its pole, informally named ‘Mordor’. Speaking of moons, we’ve also received the most detailed images of Nix and Hydra from New Horizons. Nix is jelly bean-shaped, approximately 22×26 miles in size, and seems to have a large red spot on one of its faces which may be a crater. Hydra has an irregular shape, that has been compared to the state of Michigan and is about 34 miles in length. It too shows signs of cratering. And this is only the beginning. There’s much more to come over the next year, and we’re highly anticipating the first ever images of the other 2 Pluto moons, Styx and Kerberos, which should be downloaded in October. There’s more to learn about the surfaces of both Pluto and Charon, with detailed spectroscopy coming in from the Ralph instrument, and more to come on the atmosphere too. So stay tuned to NASA for updates. New Horizons and Pluto have plenty more surprises in store for us, as we learn just how complex and awesome dwarf planets can be. Today’s blog is by guest blogger Dr. Jay Pasachoff. Jay is Chair of the International Astronomical Union’s Working Group on Eclipses and is Field Memorial Professor of Astronomy at Williams College. He has viewed 61 solar eclipses, and is an expert on both their use for scientific observations and their use for public education. Jay has has written several astronomy books including the Field Guide to the Stars and Planets and the textbook The Cosmos: Astronomy in the New Millennium. He last provided a blog post about occultations of stars by Pluto in 2011, about a different way of planetary bodies blocking out star light that’s a little closer to home than the exoplanet transits normally discussed in this blog. He’ll be discussing what we can learn from studying dwarf-planet Pluto blocking out (or occulting) the light from distant background stars and relating it to the forthcoming flyby of Pluto by a NASA spacecraft. For the last dozen years, my colleagues, students, and I from Williams College have been working with MIT colleagues to observe Neptune’s moon Triton, Pluto, and Charon occult stars–usually stars ranging from 14th to 17th magnitude. The starlight comes into the solar system as parallel light, so the path on Earth from which the occultation is visible is the same width as the occulting object: about 2400 km wide for Pluto and half that for Charon. Our various occultations observed are discussed at a website I set up at http://stellaroccultations.info. Our group now extends to include Bryce Babcock and me at Williams College; Michael Person, Amanda Bosh, and Carlos Zuluaga at MIT; Amanda Gulbis at the South African Astronomical Observatory; and Stephen Levine at Lowell Observatory, as well as students and others. Carlos posts the MIT group’s latest predictions at http://occult.mit.edu. Person, M. J., E. W. Dunham, A. S. Bosh, S. E. Levine, A. A. S. Gulbis, A. M. Zangari, C. A. Zuluaga, J. M. Pasachoff, B. A. Babcock, S. Pandey, D. Amrhein, S. Sallum, D. J. Tholen, P. Collins, T. Bida, B. Taylor, J. Wolf, A. Meyer, E. Pfueller, M. Wiedemann, H.-P. Roeser, R. Lucas, M. Kakkala, J. Ciotti, S. Plunkett, N. Hiraoka, W. Best, E. J. Pilger, M. Miceli, A. Springmann, M. Hicks, B. Thackeray, J. Emery, S. Rapoport, I. Ritchie, M. Pearson, A. Mattingly, J. Brimacombe, D. Gault, R. Jones, R. Nolthenius, J. Broughton, T. Barry, 2013, “The 2011 June 23 Stellar Occultation by Pluto: Airborne and Ground Observations,” Astron. J. 146, 83 (15pp), October, doi:10.1088/0004-6256/146/4/83. For the ten minutes or so nearest to the occultation for ground-based telescopes, the object and the star appear merged, and we detect the occultation by the light curve. For Charon, with no atmosphere (and our occultation method is very sensitive), the starlight disappears abruptly. If the star is brighter than the occulting object, the occultation is quite noticeable; if the star is fainter, then just a percentage is subtracted from the total. For Pluto (and, earlier, for Triton), its atmosphere bends and distorts the starlight, and the ingress and egress are slanted on the light curve. These ingresses and egresses can last a minute or so with a central occultation of five minutes or so, depending on the relative speed of Pluto with respect to the star. Astronomical circumstances currently put most of the occultations visible mainly in the southern hemisphere. Last year, in late July 2014, my student Adam Schiff ’15 (Keck Northeast Astronomy Consortium, from Middlebury College), Robert Lucas from Sydney, and I observed from the Mt. John University Observatory of Canterbury University, New Zealand. The observatory is about a 3-hour drive west of Christchurch. We were helped especially by the observatory’s superintendent, Alan Gilmore. Even though the UCAC star catalogue’s values of 15th magnitude for the occulted stars were high by about two magnitudes, we succeeded in observing two occultations by Pluto out of the three we tried. While we were there, we had heard from Wes Fraser of the Herzberg Institute of Astrophysics, Canada (who I knew from when we were both in Mike Brown’s group at Caltech a few years ago) about a prospective occultation by the KBO Quaoar, and also from NZ occultation coordinator David Herald about a prospective occultation by Pluto’s tiny moon Nix; we have flat light curves for both of them–that is, no occultation shadow passed over our site. One needs a dense picket fence of telescopes plus a lot of luck to capture occultations of such small objects. While we were there, we had coordinated observations from Amanda Gulbis with the 4-m telescope on Siding Spring, Australia, and with David Osip on the 6.5-m Clay, Stephen Levine on the 4.1-m SOAR, and Mike Person on the 2.5-m DuPont telescopes in Chile but they, unfortunately, had clouds for the most part. After our observing run was over in New Zealand, there was another event in Chile, with an especially bright star for us, 12th magnitude. But clouds came in 90 seconds before the predicted ingress. Still, our colleagues noted on the light curve a 2% dip just before the clouds came. Was it from a ring around Pluto? Was it from a hitherto unknown moon of Pluto? It turned out that it was from a previously unknown 15th magnitude star lurking in the Airy disk of the 12th magnitude star, as our colleagues soon confirmed with Keck AO. It was clearly much less exciting to discover a 15th magnitude star than to find a ring around Pluto or to discover a moon. Anyway, we have the light curve of an occultation by that 15th magnitude star, which was the typical brightness of our occultation stars that we were observing anyway. We are about to submit a paper to the Astronomical Journal about our results. It is important to search in the Pluto system ahead of and behind Pluto itself, since the New Horizons spacecraft’s radio signals are so weak that it will take 18 months or so after the July 14, 2015, flyby to send back all the data (from about 40 au; at 8 light minutes per au, it takes over 5 hours to get signals back at all). So if the spacecraft is killed at flyby by running into a ring particle or other dust, then most of the data–even from closest approach–would be lost. Our earlier occultation observations provided some limits on the dust content, and were among many pieces of evidence considered by the New Horizons team at Southwest Research Institute, headed by Alan Stern, in targeting their spacecraft. We actually don’t know exactly how big Pluto is, because its lower atmosphere is opaque to starlight during occultations. It could be from haze in the lower atmosphere or thermal inversion. Eris, on the other hand, is so far out that its atmosphere has frozen and snowed onto the surface. We therefore now know from occultation studies by the Bruno Sicardy group from Paris just how big Eris is, and it turns out to be near the lower end of the possible range of Pluto’s size. Would the IAU have reclassified Pluto as a dwarf planet in 2006 if Pluto hadn’t been thought to be smaller than Eris? (It is certainly less massive, since each has at least one moon that has provided an accurate mass value.) Would NASA have launched a spacecraft to Pluto if it hadn’t been thought to be the 9th, and the only unvisited, planet? We have a prediction this year for the occultation of a 12th magnitude star from the region of New Zealand, and perhaps the lower half of Australia. (http://occult.mit.edu/research/occultations/Pluto/P20150629) If you can observe from the centerline, you might get a central flash from focusing of the starlight all around Pluto–as we once got (with much luck) from Hubble. With this desirable possibility in mind, NASA’s SOFIA (Stratospheric Observatory for Infrared Astronomy) will fly out of Christchurch, with Mike Person from our group on board. Amanda Bosh will be in Flagstaff, coordinating last-minute updates to the astrometry. Bryce Babcock and I will be at Mt. John, with our Williams College undergraduates Rebecca Durst ’17 and Christina Seeger ’16; Alan Gilmore will continue to assist us, even though he has retired. This time, we have not only the 1-m telescope but also an adjacent 0.6-m telescope, for which Stephen Levine will bring down an infrared camera from our Williams College alumnus Henry Roe who is now at the Lowell Observatory. We even have arranged with a Japanese group who use a second 0.6-m telescope to get three-color photometry from it, unless they have an urgent need for it as part of their gravitational-lensing program. Amanda Gulbis will be observing from a different location in New Zealand, to give us a different chord. The Southwest Research Institute (SwRI), especially Leslie Young and Eliot Young, have also arranged observations from telescopes around Australia and New Zealand, just as we are coordinating with other telescopes besides those at Mt. John. The Bruno Sicardy group from Paris also has its own prediction. It could be particularly important and interesting to be observing so close to the July 14 flyby by New Horizons, since then we can compare results taken at a comparable state of Pluto’s atmosphere. The atmosphere of Pluto, far from snowing out by now even though it passed perihelion in 1989, had warmed slightly and had increased pressure by the time of our 2002 observations, and has since leveled off. There will certainly be enough atmosphere for New Horizons to observe, which had not been clear a dozen years ago. It must start cooling at some point, as Pluto recedes from the Sun. We hope to calibrate our atmospheric models with the new size of Pluto we will get from New Horizons, and to follow Pluto’s atmosphere as it continues to evolve. Our occultation work at Williams College has been sponsored by grants from NASA’s Planetary Sciences Division, most recently NNX12AJ29G. The Planet Hunters team has decided to first show all the light curves for all the red dwarf stars. These stars are much smaller than the Sun, live for tens of billions of years or more, and have habitable zones very close to the star. They’re the best chance to find habitable, Earth-like worlds. Red dwarfs are also the most common type of star in the universe, making up about 70% of all stars. 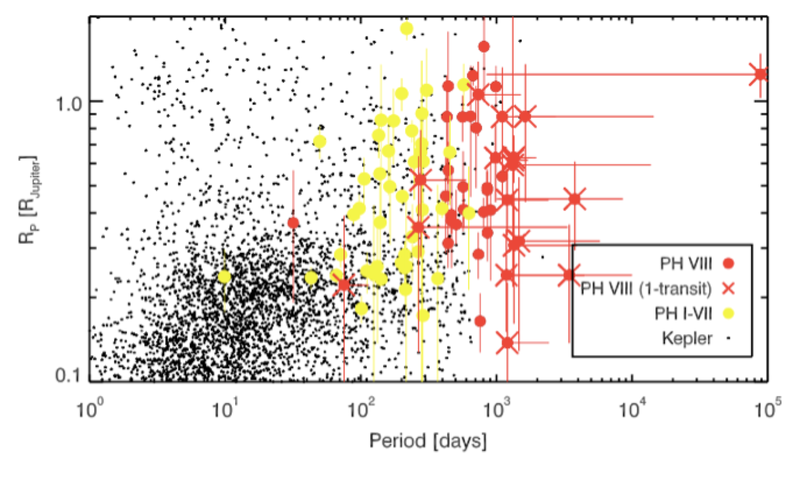 Kepler has only observed about 4,000 red dwarfs consistently, so we hope to finish this project over the course of just a few months (but keep in mind that the peer-review process can take longer). If we’re successful, we will do the same thing for the tens of thousands of Sun-like stars. The biggest challenge in exoplanet statistics is to know how many planets we’re missing. However, we can actually figure this out by creating “synthetic data”. To non-scientists, this might sound like nonsense, but this is an extremely important tool that scientists use all the time. We must “inject” synthetic transits of planets of various sizes and periods into real light curves and let the Planet Hunters users classify them. This allows us to know how effective we are at finding these planets and correct for how many we’re missing. For example, if Planet Hunter volunteers detect 50 of 100 synthetic Earth-size planets at a period of 300 days, then we know that if we detect 5 true Earth-like, 300-day planets, there are actually about 10 of them. Unfortunately, in order to correct (with any sort of scientific certainty) for the number of planets that we all may miss, we must inject a large number of synthetic planets into the real data. This project will roll out with the release of our new site. The Planet Hunters team is excited about this new project and wants you to know that you will be helping answer one of the most important questions in astronomy: how common are planets in the Milky Way?